Previous designs of reflecting microscope objectives using spherical mirrors have approximated to a design derived from theory due to Schwarzschild, consisting of two concentric mirrors giving a central obstruction of the numerical aperture of 45 percent. Except for the designs of Matsukov, where the central obstruction takes even higher values, the numerical aperture has been limited to 0.5. Theory has been taken as indicating that there was little room for improvement without a high degree of asphericity in one of the mirrors. 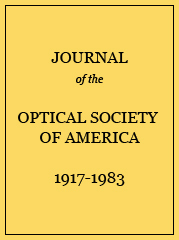 By an experimental approach, using a microscope interferometer, it is shown in the present work that the Schwarzschild conditions may be forgotten completely and very useful designs of objectives still produced for purposes where a large field area is not required. Such reflecting systems may be made little bigger than refracting objectives and have numerical aperture 0.60 and 35 percent central obstruction, and are free from spherical aberration. No refracting components or compensating lenses are employed. Mechanical parts for these objectives and a microscope stand are described. Errors in wave front of 2 objectives measured from interferograms of Fig. 4 (λ=5461A). Dimensions of reflecting objectives: (Field diameter measured at 5461A. Working distance and separation of mirrors are given approximately).